Breast meat works best for this recipe. As it is extra work to shred thigh or leg meat, breast meat is best. Bring the 2 quarts of water to a boil. Add the equivalent of 2 tbs. of chicken boullion to the boiling water. Add the 2 ozs. of onion, split garlic and 1 tbs. of salt if there is no chicken boullion. Return the pot to a boil, whence lower the flame to a simmer and skim the scum for the first 20 minutes. Partiallly cover and simmer on the lowest possible flame for 25 minutes longer. Remove the meat, cool and shred, reserve the cooking liquid. Rinse the tomatillas and chiles under running water. On a hot griddle, roast the tomatillas and chiles until a few black spots form. In the water used to prepare the chicken, add the tomatillos and chiles. Cover, return the pot to a boil, lower the heat to a low boil, and cook for 10 minutes. Next, check the tomatillas to see if they are translucent. If yes, remove from them from the heat with a slotted spoon. Reserve the cooking liquid. And the chiles. It is preferable to have some of the tomatillas undercooked to add thickness to the sauce. In a blender mix the tomatillas, chiles, and 1 1/2 tbs. minced garlic for about 2 to 3 minutes. This will make a "terse" sauce. If it is too thick, add 1 tbs. at a time of the cooking liquid. In a cazuela, heat the 1/2 cup of corn oil. When it is hot, pour in the sauce and fry it for 60 seconds, whence lower the heat to a simmer for 5 minutes. The sauce is done. Cover to keep hot. Heat a small cast iron skillet with 2 tbs. of corn oil, for 5 minutes. Next, add the pumpkin and sesame seeds. Watch carefully to prevent scorching. When carmelized, remove to a pyrex or metal utensil. When the seeds cool sufficiently, grind them in the oil in the blender and add to the tomatilla sauce. Next, preheat the oven to 400° F. In a skillet heat 1/2 cup of corn oil on medium heat. Next, add the cream to the sauce, raise the heat and return to a low simmer, taste to check for salt. Cover and reserve. Pass the tortillas through the heated oil, drain briefly on a grid over paper (newspaper is OK), put the tortilla on a plate or cutting boards. Add 1 tbs. of shredded chicken to each tortilla. Roll it up, put it in the casserole. When all 18 tortillas are ready, pour the sauce over them, sprinkle the shredded Manchego cheese on top. Put in the oven for 10 minutes, next run them under the broiler for 5 to 6 minutes to brown the cheese. Serve on a bed of shredded lettuce with the onion ring and radish garnish. On 31 October 2013, I see that this recipe became a topic of discussion at the eGullet forum. The original poster asked about the sauce used at Sanborn's in Mexico City. I immediately want to point out that Mexican Cuisine is far more regional and local than United States Cuisine and as such the sauce which was queried about may be local to Sanborn's in Mexico City and not any other Sanborn's in Mexico. As the original poster asked about a salsa verde, without tomatillos, I may have a solution. Only her father's taste buds would know for certain. The first secret ingredient is solved by the inclusion of information I have previously not put online. Please forgive. The second secret ingredient is likely to be hoja santa and I won't show all the variant spellings for this herb or ingredient. The plant, widely used in Mexico, is botanically named: Piper Auritum. I have posted about this plant at Danger! Men Cooking! as I have only recently been able to obtain it commercially. While I have not eaten Enchiladas Suizas in Mexico City, at the Sanborn's the original poster at eGullet queried about, I am pretty sure this may be what she is after, although good luck finding some fresh from the cow warm milk to ferment. Looking at the Sanborn's menu, I see that the few listed ingredients do have crema and salsa verde, so my best guess for the lady looking to reproduce their recipe is to cook the hoja santa and blend it to a puree, whence, add the sour cream and use it as Sanborn's salsa verde. 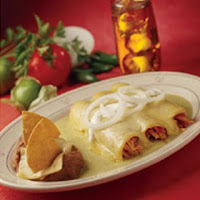 I'm uncertain as to whether the enchiladas suizas have a garnish of Swiss Cheese, I guess they are using a Mexican cheese.